Yes, based on your question, I think PDF to Word OCR Converter will be your best choice. 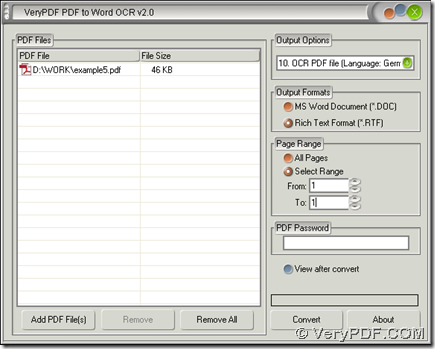 PDF to Word OCR Converter can help users recognize different languages text in scanned PDF file during conversion of scanned PDF to Word in Windows platforms. And you can get more information from the following paragraphs. 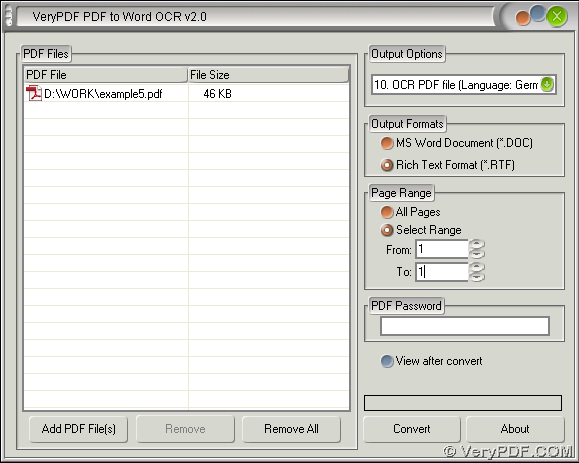 You need to download installer of PDF to Word OCR Converter from here. Then, double click this installer and follow setup wizard step by step so that PDF to Word OCR Converter can be installed on your computer successfully. So at here, if you are interested in PDF to Word OCR Converter, please visit homepage of PDF to Word OCR Converter. For any concerns on process to recognize German text in scanned PDF file in conversion from scanned PDF to Word, please leave your comment here. This entry was posted in VeryPDF Blog and tagged scanned PDF to Word. Bookmark the permalink.